Quiche is one of those things that always catches my eye on restaurant menus. 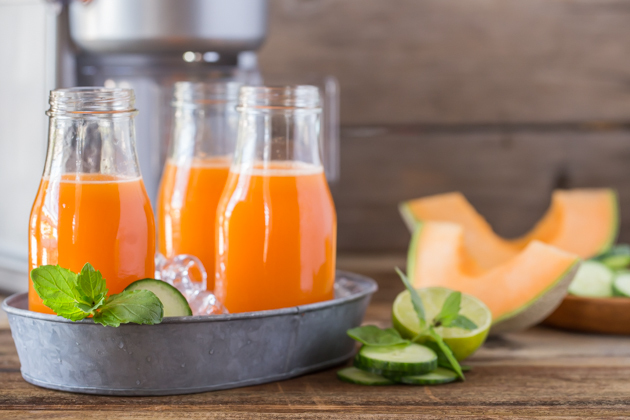 I never seem to grow tired of it, and it seems perfect any time of the day – with fresh fruit for breakfast, for a classy lunch served with a simple green salad or an easy, casual dinner paired with soup and a crusty loaf of bread. It’s also one of my favorite things to make at home. I love that it can be prepared in advance and served either at room temperature or rewarmed. It’s super versatile too, like a blank artist’s canvas – quiche can take on a million ingredient combinations. You can add an amazing variety of meats, seafood, veggies, spices, herbs, etc. There seems to be only one problem with quiche. It’s that we try to eat decently healthy for the most part, and quiche generally doesn’t fit the bill. The ingredient list for the filling is usually eggs, cheese and cream or milk, not exactly light and lean. Then there’s the crust; either a pâte brisée (a classic buttery tart crust), a shortcrust or a puff pastry crust, none of them “decently healthy” either. Not being one to forego our favorite foods, I’ve learned a few tricks to enable quiche to be on our frequent-flyer menu list. In lieu of cream, half and half or milk, I use 0% fat Greek yogurt. Not only does it cut down on calories and fat, it adds some extra protein, which is always a bonus. I also keep the cheese to a minimum, adding just enough to impart creaminess and flavor. Another trick is portion control. I like to make my quiches in individual-size serving dishes so it’s easier to eat the appropriate portion size. The small quiches control the amount of food that ends up on our plates; plus it makes for a pretty presentation. Finally, except for special occasions, I just skip the crust. With lots of delicious seasonal add-in ingredient options, we really don’t miss it. Now that we’re in the autumn mode, I incorporated roasted butternut squash, fresh sage and, for just a bit of a splurge, a scatter of applewood smoked bacon to my little mini-quiche. I used my new KitchenAid® 12″ Convection Digital Countertop Oven to bake my quiche and for roasting the butternut squash. As with all of my other KitchenAid appliances, this small kitchen workhorse is so well designed. I love the versatility of this oven, as it seamlessly converts from regular to convection baking, not to mention broiling, toasting, warming and re-heating. It also has special settings for pizza, cookies, bagels and roasts. I find myself using this little beauty (I LOVE the turquoise color) quite frequently these days. 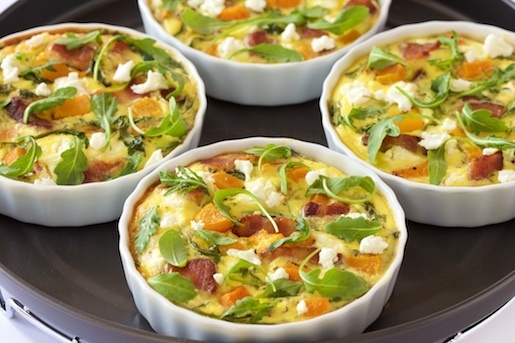 You won’t believe how easy these quiches are to put together. Just preheat your KitchenAid® 12″ Convection Digital Countertop Oven to 400˚F and spray 4 ramekins with cooking spray. Then combine diced butternut squash, a splash of olive oil and a good pinch of salt on the non-stick multipurpose pan (it comes with the oven), stir to combine, and place in the oven. The squash bakes up quickly and evenly and is tender and golden before you know it! 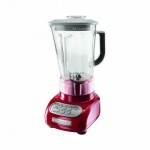 Next, just add Greek yogurt, eggs and salt to a KitchenAid® 5-Speed Blender. Give it a good whir, then add a bit of minced sage for lots of fall flavor! Arrange the ramekins on the non-stick multipurpose pan that comes with the oven and divide the egg mixture between them. Leave a little room as you have more yummy stuff to come! Add the butternut squash, bacon and arugula, a little at a time until all ingredients are added. 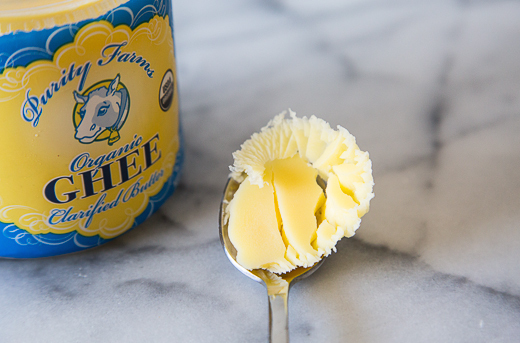 For a final touch of deliciousness sprinkle the tops with crumbled goat cheese. Next, bake the quiches until slightly golden and no longer wiggly. I love to use the convection feature, as it helps everything bake so evenly. They emerge from the oven looking quite beautiful; but if you want to impress, you can garnish the tops with more arugula and crumbled goat cheese. Love quiche but not all the calories and high fat ingredients? Pick up a butternut squash, some applewood bacon and fresh sage next time you’re at the market and make these delightful little crustless quiches for a delicious lunch or dinner. 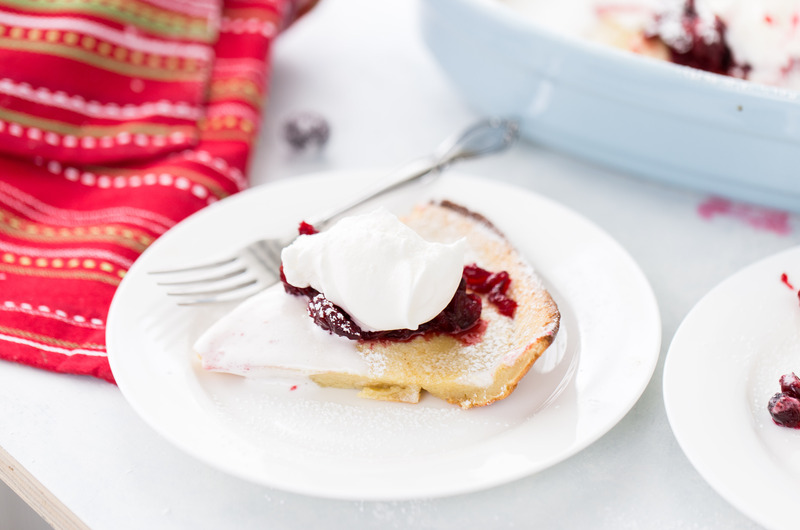 Expect frequent requests for this recipe from family and friends! 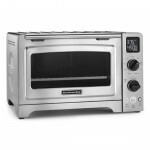 Preheat a KitchenAid® 12″ Convection Digital Countertop Oven to 400˚F. Spray 4 (6-ounce capacity) ramekins with cooking spray. Set aside. Combine butternut squash, olive oil, salt and pepper on the non-stick multipurpose pan and stir to combine. Place pan in KitchenAid® 12″ Convection Digital Countertop Oven and bake for 18-20 minutes, or until tender and beginning to turn golden. Remove from oven and set aside. Reduce oven temperature to 350˚F. Place Greek yogurt, eggs and salt in a KitchenAid® 5-Speed Blender. Blend on medium speed for 15 seconds until smooth. Add minced sage and stir to combine. Place ramekins on the non-stick multipurpose pan and divide the egg mixture between them, filling approximately three quarters full. Add the butternut squash, bacon and arugula, a little at a time until all ingredients are added. Sprinkle with crumbled goat cheese. Bake for 20 minutes or until quiches are light golden brown and no longer wiggly in the center. Remove from oven when done and garnish the tops with more arugula and crumbled goat cheese, if desired. Serve hot.